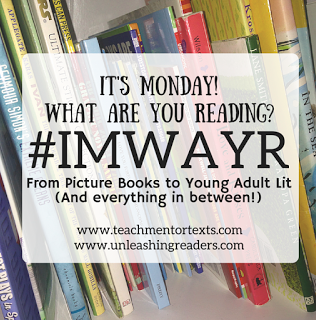 A huge thanks to Jen at Teach Mentor Texts and Kellee at Unleashing Readers for hosting us for the kidlit version of #IMWAYR!! With a huge apology to my favorite independent bookstores, recently, my favorite place to look at books for a first read is the public library. The new book shelves for chapter book fiction, picture book fiction, and nonfiction are some of my first stops when walking in the door, and they are always brimming with titles I want to read. Two of my favorite children's books in the last few weeks are incredibly different in the audience they would have, but I loved them both. 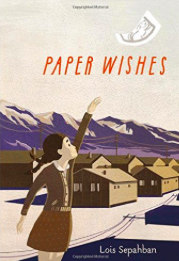 Paper Wishes by Lois Sepahban is a wonderful story that has Japanese internment camps as its historical backdrop. It's the story of Manami, a ten year old girl, and her family. Like Japanese families in many places, Manami and her family are uprooted from their beloved home on Bainbridge Island and sent to an internment camp during WWII in an arid desert area of California. When Manami tries to sneak her dog into the camp with her and fails, she becomes "mute". This is a story of the strength of human nature, and it will tug at your heartstrings. It would be wonderful to pair Paper Wishes with a book like Baseball Saved Us. 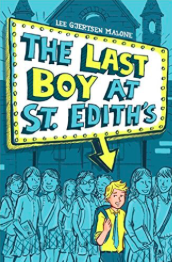 The Last Boy at St. Edith's by Lee Gjertsen Malone has an entirely different feel to it. St. Edith's is an all-girls' private school that tried to increase enrollment by expanding their student population to include boys. However, for multiple reasons, over the past few years, the boys have been dropping out of St. Edith's like flies. Every boy hoped he would not be the last boy left on his own, but that wasn't going to be the case for Jeremy Miner. He has become the "last man standing", and he is now on a campaign to get himself kicked out of the school. 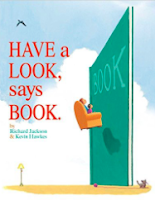 On the flap, it says this book is about "fitting in, standing out, and finding the place where you belong." I couldn't have said it better. One of the threads of this book I enjoyed the most is noticing the natural friendships that can occur with boys and girls before the hormones get in the way. 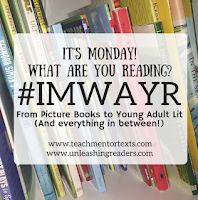 I hope you have a great week of reading! I was recently listening to a podcast Penny Kittle did with Donalyn Miller. I love to hear Donalyn talk about books she loves, so when Penny asked in this podcast what Donalyn has read and would recommend, she immediately shared about Dumplin', a book by Julie Murphy. Donalyn shared many reasons to read this book in the podcast - Texas beauty pageants, friendship, can the big girl get the cute guy, tiaras, quirky characters, just to name a few. She was spot on. It was a delightful romp - at times funny, at times poignant, at times infuriating. But at the center of it all was Willowdean, known as Dumplin' to her mom, a former beauty pageant winner. 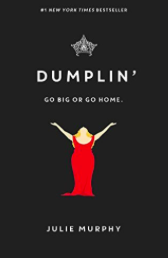 I took a personal day this past Thursday, so knowing that I could sleep in a bit more than usual, I went to the library to pick up the copy of Dumplin' I had reserved Wednesday night, I began it after dinner, and I didn't put it down until about 1:30 AM when I finished it. What a lovely evening that was! I love Kirby Larson's writing, and her fascination with embedding history in what she writes. The period she focuses on in this book is when President Taft lived in the White House. I like the character of Audacity because she is spunky, willing to take on challenges, and has a never give up attitude, which must be difficult at times because she is an orphan. Part of this reminded me of a female version of The False Prince - an orphan taken to help a bad person trick others for their own personal gain. And like Sage in The False Prince, once the plot is discovered, Audacity does her best (with the help of some friends) to rectify the situation. This was a fun, fast-paced read, and the last line leads me to believe there will be more fun from Audacity in the future! This fun picture book written by Richard Jackson and illustrated by Kevin Hawkes is a playful look at how a read aloud time with a dad and his daughter leads into a journey inside a book. Great describing adjectives accompany each sentence. What a fun way to play with words and adjectives as the dad/daughter pair make their way through the book. A wonderful opportunity to enrich vocabulary with children and appeal to their tactile sense. It is the weekend, and even though most people post their celebrations on Saturday, I'd like to post mine today. Thanks so much to Ruth for hosting all of these celebrations and giving us a forum. I read recently that cousins are some of your very first friends. I'm not sure if that is exactly true, but I do know that from an early age, my cousins were a huge part of my life. My mom came from a family of eleven brothers and sisters, most living within an easy 45 minute car drive from our house. I have incredibly fond memories of much time traveling to and from cousins' houses for family visits, or to have overnight stays. As fun as those early memories are, it is even more sweet when those cousin relationships continue to grow into deeper friendships as we are now adults. I'm sad to say that, with the deaths of both of my parents in the last 18 months, and all the grieving and issues that needed to be dealt with, I have only seen these special people at my mom's calling hours, her funeral, and then again, last July, at my father's calling hours. I am celebrating that the drought of not seeing them has come to an end. A group of those adult cousins gathered at a Mexican restaurant this past Friday. There was laughter, oh yes, there was lots of laughter. There were hugs given multiple times, but definitely as we gathered in the beginning, and then again, as we left. There was talking, sometimes multiple conversations at one time. There was a lot of catching up to do; it was difficult to know which topic to tackle next. There were tears as we shared about health, children, worry about parents, loss, and much more. But, most importantly, there was love. And that love is both a gift and a celebration. I took a personal day this past Thursday, and spent the day with my friend from college. 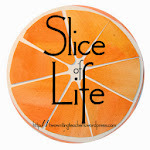 We began at the newly renovated art museum in our city, did lunch, and then browsed in the North Market, a space filled with a bounty of specialty foods. At the museum, we made it to each and every exhibit, making time to discuss works of art that spoke to each of us, and allowing ourselves to be awestruck by the genius of the various artists. The exhibit of the featured artist, Melvin Edwards, is an area we spent a lot of time, reading about each of his pieces, and then bringing our life experiences to each piece to help us understand. I was amazed at his use of welding iron materials, chains, and barbed wire to make statements. We had a delicious lunch at the new museum cafe, and then strolled the courtyard to discover even more wonderful pieces of art. The North Market found us sampling, tasting, and buying many things. No plans for dinner that night?? -- no worries! We had it covered with our samples of this and that! But, as fun as the art experience and food browsing was, much like with my cousins, it was the time to be together that made this a spectacular day. And it is a huge celebration that, almost 43 years after we first met, we are the kind of friends who are family. Another gift in my life. Our youngest daughter ran the Nashville marathon yesterday, and got a Personal Best Record for her time. She had worked and trained with diligence. And then yesterday, she had to overcome some obstacles along the way - a delay of the start for 40 minutes due to lightning in the area, rain (heavy at times), humidity, and hills. If you've ever been to Nashville, you know there are hills everywhere, and over a 26.2 mile course, she ran many of them. So, I'm very proud of her, and this accomplishment. I am celebrating for her diligence, her perseverance, her strength, and her PR. I look forward to this next week, and whatever celebration awaits!